Google loves space. So much so that it's giving it the chance to experience Project Tango before most people on the terra firma. Project Tango is Google's line of smartphones and tablets that can map a 3D image of the world around them thanks to a bunch of onboard sensors. And it turns out that they're also perfectly suited for space robots. NASA's Synchronised Position Hold, Engage, Reorient, Experimental Satallites (SPHERES) will soon be using Tango phones to become smarter. 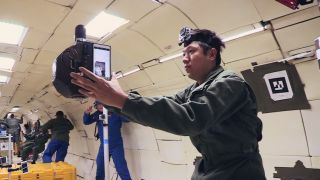 Tango's motion-tracking camera and infrared depth sensor will create a 3D map that will allow the robots to move around the station more precisely. Essentially, the phone is giving them eyes and ears. "We wanted to add communication, a camera, increase the processing capability, acceletometers and other sensors," Smart SPHERES project manager Chris Provencher told Reuters. "As we were scratching our heads thinking about what to do, we realized the answer was in our hands." A bunch of Project Tango phones will be fired into orbit on a cargo spaceship on July 11. At which point, robots will genuinely have better smartphones than most of us.